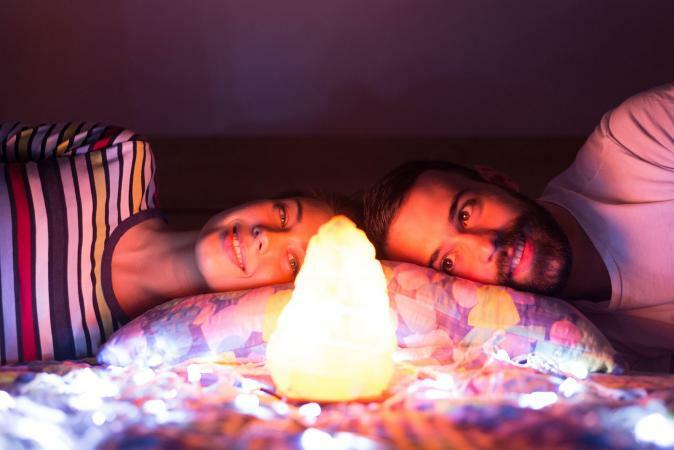 Caring for your Himalayan salt lamp is effortless. There are a few quick things you can do and a few to consider when using this type of lamp. If you follow specific care instructions, your lamp will last a long time. The main concern that you may have for your Himalayan salt lamp is what's known as sweating. The salt acts as an air purifier by absorbing moisture in the air that's known as microscopic water particles. When the lamp is turned on, the salt grows warm and the moisture it collects slowly evaporates. This is known as a hygroscopic process. Often the moisture will collect on your salt lamp. If you live in a very humid environment, you need to leave your lamp on a minimum of 16 hours, preferably 24/7. When the salt lamp is not heated by the light bulb, it will absorb/attract more moisture. Some people living in high-humidity regions feel better by protecting their furniture with a plate or protective plastic underneath the lamp base. If your Himalayan salt lamp appears to be leaking or you find a pool of water around it, carefully unplug it and remove the light bulb once it is no longer connected to the electrical outlet. You want to be sure the lamp doesn't short out, blow the bulb or cause other electrical problems. If your lamp is absorbing a large amount of moisture, the salt can dissolve or break off. There is a quick remedy for this problem. Once you've unplugged the lamp and removed the light bulb, place your lamp in direct sunlight until it has dried out. Once the weeping has ceased and your Himalayan salt lamp is dry, you need to return the bulb and plug the lamp into the outlet. Turn on the lamp and if possible, allow it to stay on 24/7 to ensure the moisture doesn't begin to accumulate again. If you live in a low-humidity, dry environment, your lamp probably won't sweat. If it does, don't panic, just leave it on 24/7 until it dries out once more. If the sweating is excessive, follow the appropriate steps to allow it to dry out. Sometimes, white crystals form on Himalayan pink salt lamps. This is a natural reaction to the evaporation of moisture collected in the salt. The white residue can be wiped off the lamp with a slightly damp cloth. There should be no harm done to your lamp when this happens. If you live where the humidity is high, this color change will be more prominent. Never rinse your lamp. Just as table salt dissolves in water, so will your Himalayan salt lamp. You can increase the light bulb wattage to remedy an ongoing problem with a build-up of moisture. There are a few places and rooms you don't want to place your Himalayan salt lamp. Any room that has a high and unusual moisture level, such as a bathroom, sauna, laundry room or kitchen (steam from cooking) isn't the right environment for your lamp. You should avoid placing your lamp in an unfinished basement since this space tends to have a high humidity level that would be detrimental to your lamp. Don't leave your lamp on a porch, covered deck or patio since night air is often humid. Rain can destroy your lamp if you leave it out in the elements. If you have house pets, keep them away from your Himalayan salt lamp. Cats are especially curious about most things and tend to lick objects. Salt poisoning can occur when a dog or cat intakes too much salt. Be sure to protect your pets by placing your salt lamp out of their reach. Your natural salt lamp is an easy-care addition to your home decor. When you understand how to combat moisture buildup, you can prevent your lamp from becoming over-saturated and will enjoy using your lamp with little maintenance.